Ashlee's Creation's: WOW Embossing coffee blog hop....!! 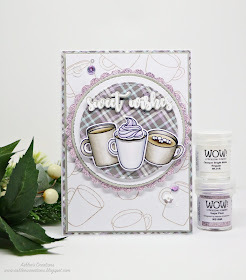 WOW Embossing coffee blog hop....!! Im so excited I was asked to be a part of the WOW coffee blog hop. I just love WOW powders, they are seriously the best... they always emboss so nicely. There is such a huge range of colours available, and some also have glitter in them making them super beautiful and sparkly!! The cute little cups and sentiment are from a stamp set by "Uniquely creative"
called "warm wishes" (there is also matching dies available too). Goodluck everyone and enjoy the hop!! Great designs for coffee lover! Awesome project and cool stamps! Loving the non-traditional color scheme of this sweet coffee card! I love the colors you used! Great design too! I just love these soft colors, great job with this card. This is gorgeous! :) Love the colors you used for this card. Beautiful card. I love the colors. Stunning. THIS is beautiful. The soft colors are gorgeous! Very pretty. Caught my eye so I had to pop on over and say so! So very gorgeous and I bet it really looks magnificent in person. Beautiful monochrmatic card. So warm and delicious. Such a gorgeous card! So elegant! wow, such an elegant and fabulous card! Such a darling card, Ashlee. THanks for showcasing WOW Embossing so beautifully.